October, 1999 - Here are a pair of quilts from a 1930s repro fabric quilter in her 30s who lives in California. She told me to say she thinks my blocks are great. 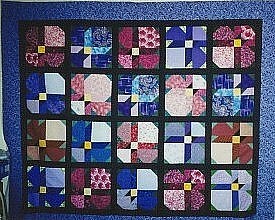 The first quilt uses Circle Flower Block from the Pieceful Garden 2 pattern. 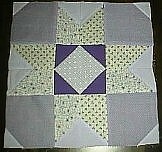 The second little quilt is done with the Sundrops Block from the Pieceful Garden 1 pattern. Aren't they beautiful? I want them! Thanks so much for sharing! August, 1999 - I have a special treat for you, two projects by cyber-friends. 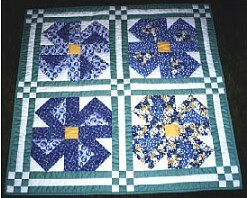 The first is one of the quilt blocks, May's Circle Flower, done by Evelyn Robison. She says,"I didn't have enough yellow and orange to do the block so I used the purples I had and thought you might enjoy seeing the picture." Doesn't this block look different? It's amazing how running out of the "right" fabric often makes for a more exciting project. Thanks, Evelyn! The second photo is from Donna Bardwell. 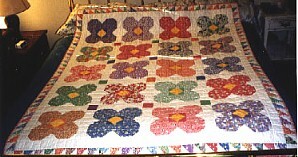 Donna's group used the pansy block for a quilt. There are eleven members in our "Bee Positive Quilt Bee', we are associated with the Trinity Valley Quilt Guild in Ft. Worth. We meet once a month at Sandy's Quilt Shop in Joshua, Texas. We make a quilt each year for TVQG Show in Ft. Worth and then we draw a name from the members who have not won a quilt yet and that person wins the current years quilt. The "Who Are You Calling a Pansy" quilt was made by each bee member making 2 blocks, which were then put together with sashing by Beverly Royer, Linda Walden added the border, I then quilted the quilt using my Gammill Classic. I then turned it over to Erna Schneider who finished the binding and entered it in the Trinity Valley Show. Erna Schneider was this year's winner. What a lovely quilt! Thanks for sharing, Donna and friends.